Senso with Alida Valli and Farley Granger. Critical consensus regards Luchino Visconti's Senso as a radical departure, a sign of the director's shift in focus from the gritty world of downtrodden proles (such as in his neorealist classics Ossessione and La Terra Trema) to a rather more exciting historical fantasy involving the illicit romance between Countess Serpieri (Alida Valli) and Lieutenant Mahler (Farley Granger) during the Italian revolt against Austria – shot in radiant three-strip Technicolor to boot. A rather more defensible truism portrays Senso as a dry run for Visconti's later adaptation of Giuseppe di Lampedusa's The Leopard. There are obvious parallels between the two: male leads played by American actors (Granger in Senso, Burt Lancaster in The Leopard), brilliant color cinematography, and a common concern with historical decline. But I think Criterion's release from a newly-restored print of Senso will do much to correct the notion that it is merely The Leopard's country cousin. André Bazin claimed that neorealism was in part inspired by 20th-century American fiction, but any debt that Senso owes to literature ought to be collected by the European novelists of the romantic era. Visconti himself admitted that Senso was, both stylistically and thematically, based as much on The Charterhouse of Parma as on its purported source novel. Additionally, the scenes of the Battle of Custoza were obviously shot by someone acquainted with the adventures of Parma's Fabrizio del Dongo. But this only seems like a departure. Stendhal and his contemporaries contain the seed of later literary realism, and Senso seems bent on combining realistic observation with more boisterous stylization. Costumes, props, color, and blocking perform sociological as well as dramatic and narrative functions, giving the world of the Risorgimento a properly lived-in feel – as well as feeding a pure delight in just looking and listening, elements that had suffered from a mild case of anorexia in Visconti's earlier work. The focus of the story may be on Countess Serpieri and Mahler, but the nameless masses get their screen-time as well. Visconti fills his backgrounds with every sort of extra going about some business or other. The celebrated first shot of a performance of Il Trovatore at Teatro La Fenice begins with the edges of the frame congruent with the borders of the stage, only to slowly crane over to reveal lounging stagehands and actors waiting for their cue, out of sight of the opera's audience. Moreover, exterior scenes in the streets of Venice take place as soldiers, merchants, widows, and every other variety of urban hanger-on cross the frame behind the two protagonists, a trick that Vincente Minnelli refined in his later color films (and one that Steven Spielberg likes to use in his own histories). When describing their reaction to a film they don't like, a person is likely to say they were “underwhelmed”; none of Senso's detractors will ever say that. Committed though it may be, Senso has a commendable cynicism about politics and about the real motives of human action – notice that the film isn't called Ideologia. After betraying the nationalist cause for Lieutenant Mahler's sake, the Countess later discovers that she has sacrificed her ideals for nothing. With her world literally lying in ruins around her, she takes the only political action left to her not as a last-ditch effort to save the revolution, but for revenge. Senso's very final scene is stylistically closest to what we think of as neo-realism and tells a truth about politics that, to a filmmaker less than ten years removed from Il Duce (to say nothing of a present-day citizen of Cairo, Teheran or Tripoli), probably felt like conventional wisdom. In addition to the parade of documentaries and interviews (all of which are up to their usual worthy standard), Criterion's DVD offers on a second disc a version of the film prepared for American audiences (but apparently never shown for some reason) with the great title The Wanton Countess. Mark Rappaport's booklet essay is accompanied by relevant and very amusing sections from Farley Granger's autobiography Include Me Out: My Life from Goldwyn to Broadway. SENSO (1954). Dir. : Luchino Visconti. Scr. : Suso Cecchi D'Amico, Luchino Visconti; from Camillo Boito's novella. Cast: Alida Valli, Farley Granger, Heinz Moog, Nina Morelli, Massimo Girotti, Christian Marquand, Sergio Fantoni. 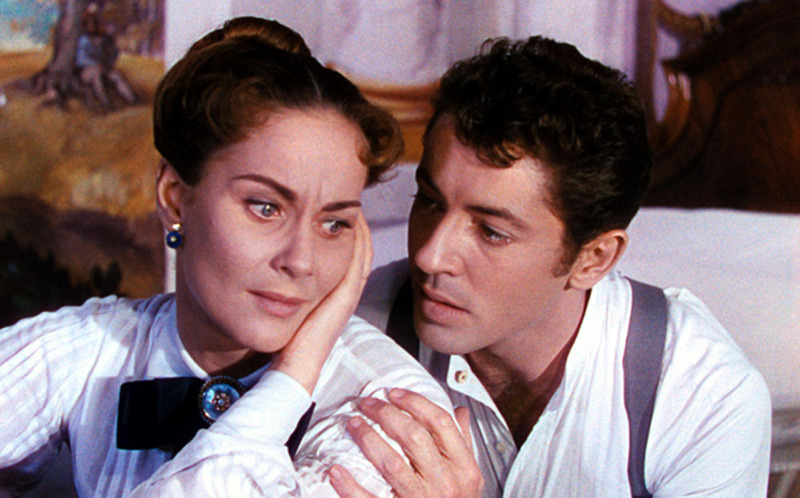 Farley Granger and Alida Valli Senso image: The Criterion Collection.